Zur deutschen Version hier entlang! We had a chance to test it for ourselves – the Greenroom Upp Classic. 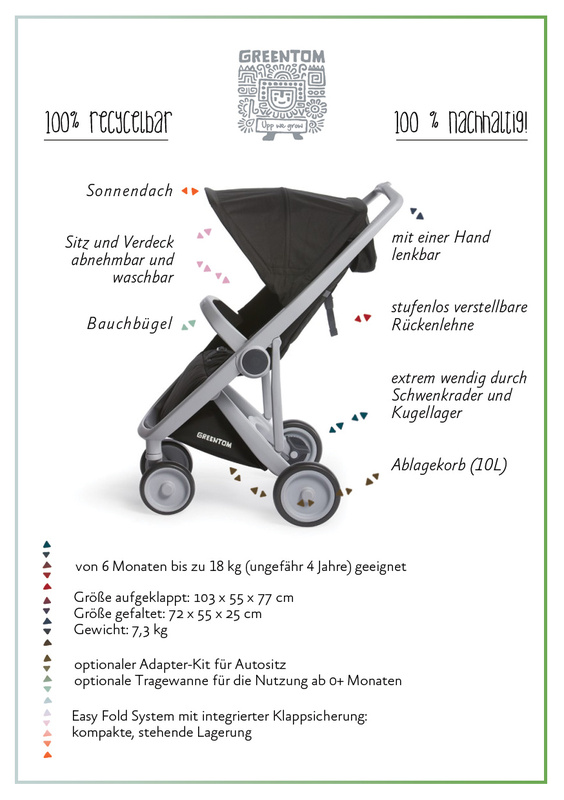 The first stroller produced 100% ‘green’. 95 % made of recycled plastic. Wow! This was the reason why we came across the Greentom in the first place, a stroller that is not only light, flexible and simple, but that is also produced from recycled material. It’s not that the Greenroom looks anything like it … it certainly doesn’t resemble an eco-stroller! Thanks to its variety of colours (the frame comes in black, grey and white, the fabric in orange, blue, teal, sand, olive,…) it’s not easy to decide on a design to begin with. We take the grey/black option. Fancy! Alright then. To test how suitable for city life the Greentom really is, we take a day off and go on a tour across Berlin. To shops offering just as “greenly” produced products for children. The weather plays into our cards, we start in Kreuzberg – canopy: check. First wee flaw we discover in the Greentom Upp Classic: Its hood is not as nicely adjustable as for example the one of the Cybex. If you really wanted to protect your child from the sun, you needed something extra. Given that after a long winter we’re still all deprived of vitamin D, the first rays of spring sun won’t bother us this time. Mommy’s giant bag also fits in, the stroller remains upright and doesn’t fall over, unlike what we experienced so often in the past. On the underground it becomes once more transparent how manoeuvrable the Greentom really is: turning on the point, avoiding other passengers, going fast, no problem. Then we reach our first destination: Monkind at Grunewaldstraße 71a, Schöneberg. 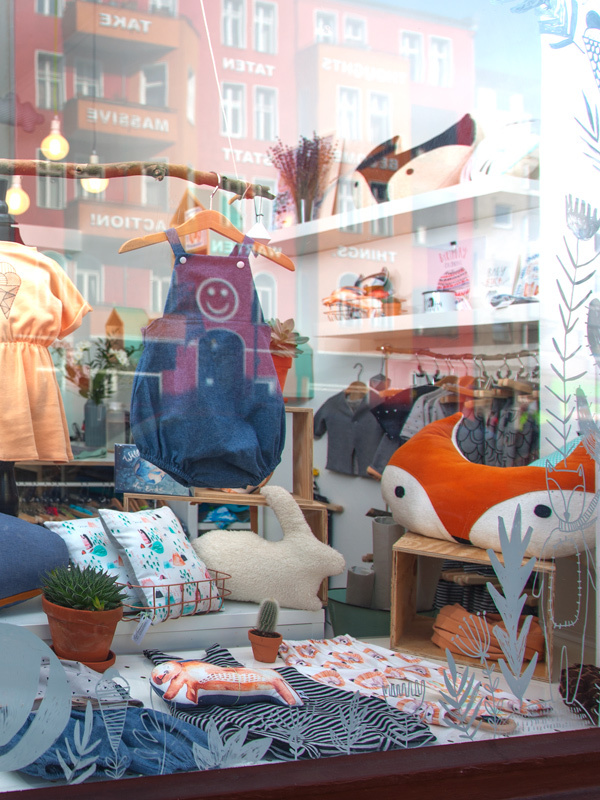 A small, lovely shop with a window dearly illustrated by Gretas Schwester. Inside, Valeria is already expecting us, her husband Stewart is carrying wood outside to build a bench for sunny days. I am reminded of why I liked the two of them the moment we first met. The fashion designer and her husband founded Monkind in September 2014, since then the shop and the online shop exist. It all began – obviously – after the birth of their first child four years ago. Valeria started sewing more and more for her child – until they all agreed to do things “properly”. And they are a perfect team. She designs, sews and silk screens the fabric, whilst he is behind the counter as well as behind the desk, taking care of the paper work, the online shop and the self-built interior. Dream team! The harmony between Valeria and Stewart is reflected inside the shop: bright, friendly, small self made details, flowers & plants, a small kid’s corner … it makes you feel welcome and invites you to hang out on one of those easy chairs, to take a bath in the atmosphere of this peaceful oasis. Valeria shows me her favourite piece from her new collection, the organic short jeans dungarees, a pretty cool short trousered overall made from denim-like cotton. The “Bio Jeans Harem Pants” – fine denim knickers with a striped growing-with-the-kid-bottom cuffs und deep pockets … yeah, that’s it! We have another look around – and everywhere we see these amazing illustrations on posters, post cards and stuffed animals. I also find this a nice casual outfit: the “Space Fox T-Shirt” combined with the “Grid Pants”. We like to hear that. And the outfit is added to our wish list! You will find more nice things at Monkind, or just follow Monkind on facebook or instagram. We take a short break at Frau Bäckerin in Eisenacher Straße around the corner. They have a lot of toys for kids outside and the big ones can relax in the sun. And that veggie lasagne! Selina and Friederike both have three kids, they meet at the nursery. 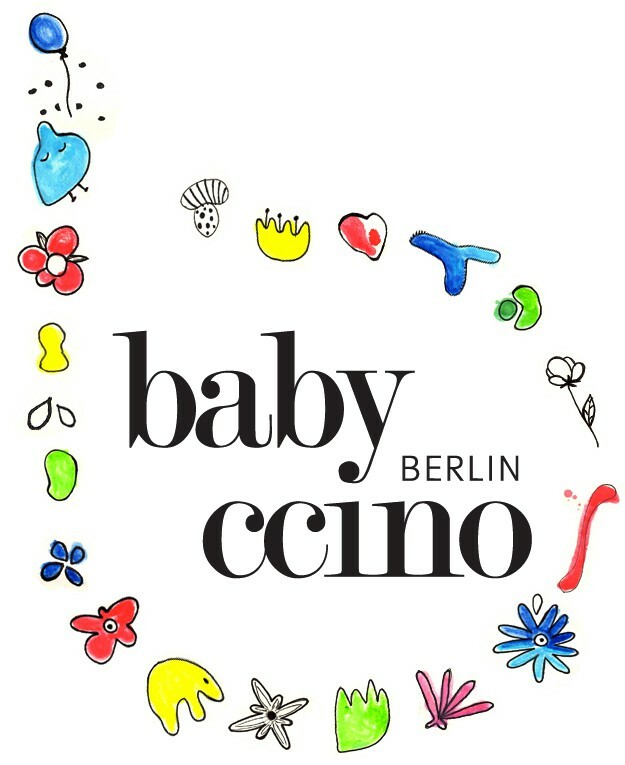 The clothes are produced by design students or seamstresses in Berlin. At ’petit cochon’, they exclusively use natural materials like wool, cotton, viscose and linen. The fabrics are bought predominantly in Germany, where they fulfil the “Ökotex” standard. I have another look around, while the little one plays contently in the kid’s corner with old classics. Especially the corduroy and denim trousers sewn from old trousers collected by Selina and Friederike – donations or from the storage of the City Mission – catch my eye. The curry-coloured fluffy reversible hat will be worn by our Greentom tester this spring! A visit is worth your while, both online as to the shop. To avoid unnecessary return shippings, ‘petit cochon’ are always happy to answer all size-related questions. And they write: “Your items are being sewn for you at the moment,” to raise awareness for a considerate way of dealing with your order, so that nothing will be shipped unnecessarily for the benefit of our environment. We like that a lot! 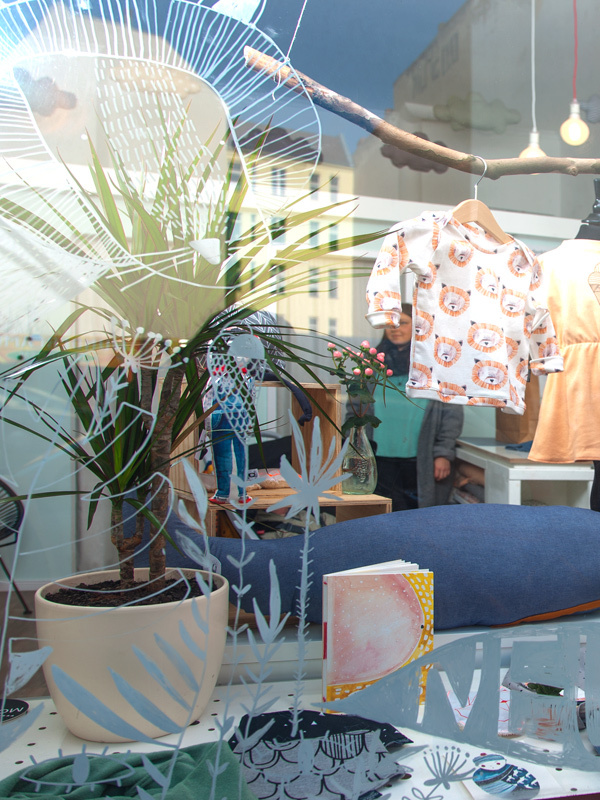 Next station our journey: Prenzlauer Berg, the lovely shop of Noé & Zoë at Rykestr. 7. It’s colourful here and the little one is getting a little excited – no problem, there’s enough space, so out of the stroller and a balloon in his hand going to discover the lovely decorated shop. … and a super cool bag, which fits perfect to the Greentom. Now there is endless storage space! Yeah! „A huge part of our current collection has already been made of organic cotton. We find even more nice things, especially accessories like hats, hairbands, scarves … so many cute stuff! All Noé&Zoë products are lovingly proudced in Portugal, to measure up the high quality, fair work conditions and employee’s wages. Have a look yourself at noe-zoe.com or follow Noé & Zoë on Instagram! Out of the colour explosion back onto the street. Thank God the sun is shining today, otherwise the world would look to sad without all theses lovely colours. Let’s go to Neukölln. At Hermannplatz we descend, push our way through the crowds to Weserstraße, and turn left into Nansenstraße. Number 2. Welcome at Kurz und Klein! It’s getting cozy in here … rather on the spur of a moment than announced, we enter the shop. And it is well-frequented! There’s a baby sling counselling for a client, the open play café and on top to that further people are emerging from the parent-kid-class “Experience Music”. Wow, let’s try and find our way around for the beginning. So it’s the perfect starting point for parents in need of counselling for a baby carrier or any other sort of information. Or just to buy organic, fair trade clothes and toys! We are done for today. And as “Kurz und Klein” offers such a good background, we fold up the Greentom here. You turn a button on one side, on the other side you press a button, and with a little bit of strain the Greentom folds up. Et voilà! And our conclusion? And the result of our Greenroom GREENtour? Click here for the website and the online shop of Greentom – enjoy! All photos except product shots by Navina Hausmann.